Joy Creek Photo Archive (c) all rights reserved This delightful aster comes from Himalaya and western China. Inch-wide flowers open on the ends of well-branched stems. 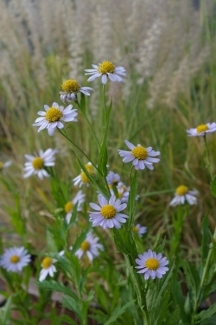 Aster altaicus has ray flowers that range in color from lilac to lavender pink with soft golden central disks. The alternate leaves are mostly entire but occasionally toothed. They are in a whorled pattern up the stems with the largest leaves occuring part-way up the stems and then descreasing in length and width as they climb. This is a fine aster to bridge the gap between the early blooming Aster x frikartii forms and the autumn bloomers. This has recently been renamed Heteropappus altaicus. June to August. 24 in. x 24 in.